This is a recipe for an Oven Pancake that is filled with fresh berries. The best way to describe it, is to say that it's a cross between a stove top pancake and a popover. The batter is quite thin, and as it bakes it puffs up and turns a beautiful golden brown with the bottom of the pancake becoming nice and crisp. It makes an impressive breakfast or brunch dish, and is even good for dessert. There are so many ways to serve this pancake. While I have filled it with fresh berries, hence the name "Berry" Pancake, you could fill it will slices of apples or pears that have been sauteed in a little butter or sugar. For breakfast I like it filled with the berries and topped either with a drizzling of maple syrup or a dollop of yogurt. For dessert I like it with whipped cream and maybe a fruit sauce (strawberry, raspberry, or blueberry). It's also very nice when you simply spread the entire surface of the pancake with your favorite jam or honey, or with a sprinkling of sugar and fresh lemon juiuce, and then roll it up. No matter which way you serve this pancake it is delicious and sure to please. Oven pancakes are a little different from the ones cooked on the stovetop. While both batters are made with a mixture of egg, milk, butter, and flour, an oven pancake's batter is thinner and is made by simply whizzing all the ingredients in your blender or food processor. Stove top pancakes, on the other hand, are made with a batter that is simply stirred together in a large bowl. For this pancake, once the batter is made, it is poured into a large heatproof skillet and placed in the oven. As the pancake bakes the top becomes slightly puffed and set. This is different from the bottom of the pancake which becomes wonderfully golden brown with crisp edges. This pancake is best served hot from the oven, although you can refrigerate leftovers and reheat the next day. Berry Pancake Recipe: Preheat your oven to 375 degrees F (190 degrees C). Melt one tablespoon (14 grams) of butter in a heavy bottomed 10 - inch (25 cm) ovenproof skillet, preferably nonstick. Then, in your food processor or blender, place the melted butter, egg, milk, vanilla extract, flour, salt, ground cinnamon and sugar. Process for about one minute, scraping down the sides of the bowl as needed. Once the batter is completely smooth, pour into your hot skillet. Bake for about 25 - 30 minutes or until the pancake is golden brown, slightly puffed and set. Remove from oven and sprinkle the pancake with the fresh berries. 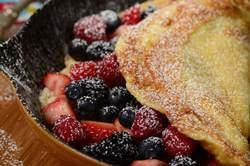 Gently roll or fold the sides of the pancake over the berries and slide the pancake onto your serving platter. Dust with confectioners sugar and serve with softly whipped cream, yogurt, or pure maple syrup.